Have you ever made a mistake? (If you haven't, I'm thoroughly impressed and demand that you tell me your secret). Broken Hearts, Fences, and Other Things to Mend is about a girl who made some mistakes and unexpectedly gets the chance to make up for it. Despite the cheerful cover and the beach setting, it is more than a light and fluffy contemporary novel. Gemma is an ordinary teenage girl. Nice, friendly, fairly well liked, utterly devoted to her do-gooder boyfriend. We quickly discover that she's not the sharpest knife in the drawer when it comes to reading certain social cues. It's obvious to the reader that her "perfect" boyfriend wants to break up with her and really isn't all that perfect. Poor Gemma eventually figures this out when it's hammered into her. So I started the book out feeling sorry for her and also rolling my eyes a bit at her blindness. Still, I liked Gemma. Her relatively low self-esteem and stunning lack of insight felt very much like a typical teenage girl. When Gemma goes to spend the summer with her dad in the Hamptons, we learn that she was there when she was 11. That summer she became fast friends with Hallie, but soon turned on her. Gemma's meanness was fairly juvenile but had negative consequences far beyond what Gemma ever intended. I loved that a book featured a nice girl who has been mean to another person in the past. Too often, books feature nice girls who are tormented or mean girls who do the tormenting. It's rare to have a book where a normal girl purposely treats someone else badly, which is much closer to real life than characters who are purely good or bad. This book creates very realistic situation. I understood why Gemma acted the way she did toward Hallie. It was undoubtedly wrong, but it seemed like something a normal, scared 11 year old would do. The majority of this book is present day Gemma befriending Hallie while pretending to be someone else. This seems like the perfect opportunity for Gemma to make things right with Hallie - to apologize without apologizing. Now's where the book gets funny. Weird things keep happening to Gemma. She gets sick during a date with Hallie's brother, a swimsuit Hallie lent her falls apart, and much more. All these things are bad, but minor enough that Gemma laughs them off as random occurrences. But they all relate somehow to Hallie. Does Hallie secretly know who Gemma really is? Throughout much of this book, I thought Hallie was playing Gemma like a fiddle. I was a bit irritated at Gemma's gullibility. But then something would happen that would make me question my own skepticism. Maybe Hallie really was in the dark. I kept turning the pages because I had to know what was actually going on. 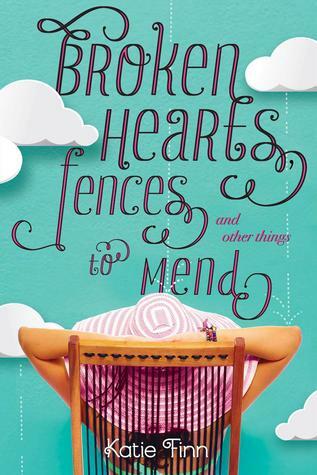 Broken Hearts, Fences, and Other Things to Mend is a delightful book about a girl who has the opportunity to right her wrongs. It's a great summer read: there's romance, hilarity, the beach, fancy clothes. What more do you need? My only complaint is the title is far too long. I hate reviewing books with long titles. Takes so long to type. And if that's the only criticism I can come up with, it's definitely a good book. *One final thing: This is the first book in a series. I didn't realize this until the last page of the book. That was quite a shock. I can't wait to read more! Hello Alison, I run a blog too. ChickLit Pad (chicklitpad.blogspot.com) and it's on my list too! With your positive review, can't wait to get to it. When I saw this one NG, I took it for a fluffy read but I'm glad the book proved me wrong. I'll add it to my tbr pile and I was also surprised it's a series. Not a lot of contemporary reads are. This book looks so much fun! I find it very hard to find books that are light but this one looks perfect. Great review! Good to know it's a series. I didn't realize that either. I have it on my TBR pile. It sounds good BUT I get so irritated when I think someone's playing someone else and that someone else falls for it! Doesn't seem like it would be a series but okay. I hate when things go wrong yet they could lead to something great right? Lovely review. Oh I'm reading this right now and I so agree, that Gemma really is a different kind of character! Loved that too! I'll have to check this out! I love her cover design!